Happy Holidays! Now that we’re well into the full-swing of holiday cheer, I thought it was the perfect time to share a little freebie with you! 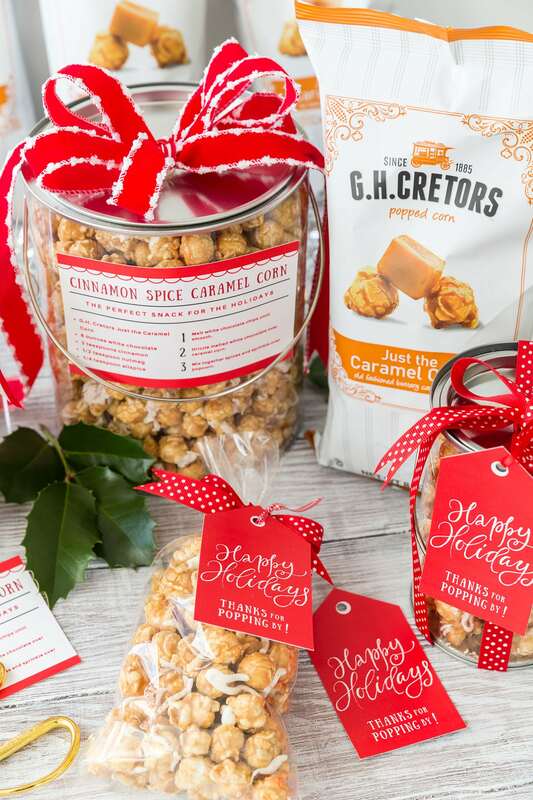 I’m super excited to share these cute gift tags with you and a delicious (and easy) recipe for Cinnamon Spice Caramel Corn! It’s the perfect holiday gift idea. First up, is printing these cute gift tags! I have two different ones for you depending on if you’re dropping a gift off for someone or if you’re hosting a party and sending guests out the door with a little favor. So pick the gift tag you want, print on a thick white cardstock, and cut out! I used a simple hole punch on the end and looped in a pretty, holiday ribbon. I love any excuse to buy holiday ribbon! Now you can go the easy route and attach it straight to your favorite G.H. 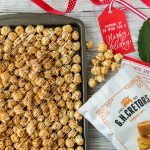 Cretors Popped Corn OR you can get fancy and spice it up. What do I mean? Oh, just the most addicting and delicious concoction you’ve ever tried. It’s Cinnamon Spice Caramel Corn, and it’s so easy to make. I even made you all printable recipe cards in case you wanted to gift out the recipe to friends and family to avoid all the calls from them asking the recipe – because it’s that good! Melt white chocolate chips until smooth. Drizzle melted white chocolate over caramel corn. Mix together spices and sprinkle over popcorn. There you have it! 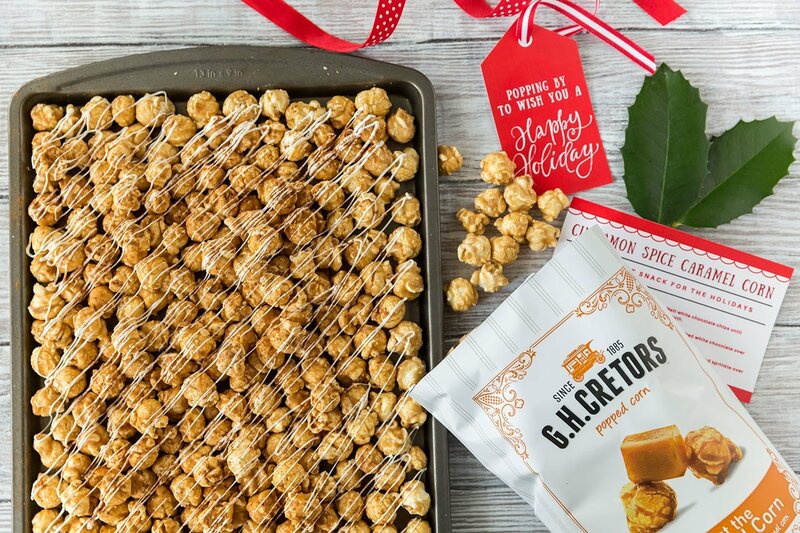 The easiest recipe for the most delicious popcorn this holiday season. There are any number of ways to package the popcorn up from a simple cellophane bag to a larger tub for a group. Add on a festive bow and ta-da! Just don’t forget to make yourself a batch this holiday season, it’s perfect for enjoying by the fire while watching holiday movies. My own family and I have been loving it this holiday season, and I know yours will too! 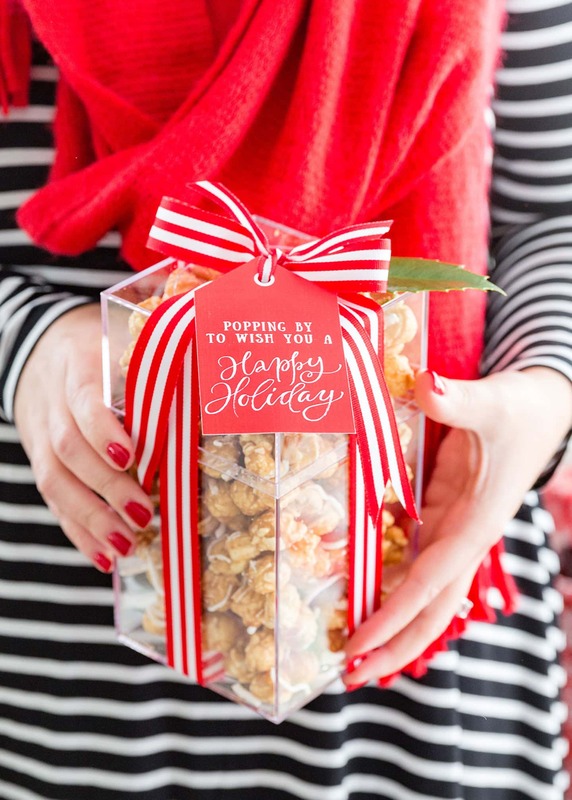 Love the popcorn idea with the gift tags and recipe. Where did you get the containers from? Hi! The “paint can” shaped ones are Container Store. The cellophane bags are from Michaels. The clear “take out box” style is also Michaels. Hope this helps! Glad you love them! What about the rectangle acrylic box on the first page? Is that from Michaels or The Container Store? Totally LOVE this…. what a great neighbor, teacher etc gift. printed off the recipe but it DIDN’T print like yours? Is there a way to print it like yours? Brandy, thanks for your comment! When you say it didn’t print like mine, what did it print like then? It’s a PDF, so if you print on a thick cardstock, cut around it (there are 2 recipe cards per single page), that’s exactly what I did. I have take notes for the popcorn gift ideas.